I enjoy my quiet time with Jesus. I seek refuge in His Word to balance my busy life and all the anxiety in it. I can chose where, when and for how long I want to be in fellowship in my savior. For inmates incarcerated at Darrington Prison this looks very different. They have time, more time than I ever have. Time to use or misuse, time to achieve or time to waste. Time to enlighten their minds, or time to be haunted by it. Going through security as you enter and exit the prison is exhausting. If you have not walked the halls of a prison where male inmates are peeking through the small windows of their doors, let me tell you, it is heart wrenching. Then, just a few steps more down the sullen hallway, we entered into the chapel. It was like entering into a separate world where men were on stage worshiping Christ and families were sitting lovingly with their inmate. This simple reality instantly changed my thoughts. But there is hope. Hope that is found in Jesus alone! Watching the inmates raise their hands and sing worship music, while being served a hot meal that was prepared by my hands gave me pure Joy! An overwhelming amount of joy that I can’t even put into words. Then, to walk away from the prison and pull away in my vehicle with my loved one at my side brought tears to my eyes, and with them a feeling of deep desperation. Desperation to share the gospel. Darrington Prison welcomed our team with open arms. They allowed Feed the Need Missions to grill burgers and hot dogs outside of its building. This is the first time that this prison allowed food to be brought in from an outside source. God orchestrated the entire event. And I am forever changed because of this experience. My quiet time will continue to offer me refuge with new insight and renewed thankfulness. Feed the Need Missions provides cold water and lemonade at each site. During the summer months we make sure we have plenty of water for all of our visitors to stay hydrated. Like Jason said, he comes for the hydration. The hydration of water and community. In 1986 David accepted Christ after marrying his wife at the age of 18. He and his wife were deployed to Korea where David was a medic for 7 years. He was released from the Army because of a heart condition. Years after his heart diagnosis, he was in a tragic car accident that caused brain damage to the right side of his brain that has left him paralyzed. Not being able to have full range of motion to the left side of his body has caused David many limitations and he’s currently homeless. We are encouraged by David’s servant heart and inspired by his faith and love for our Savior, despite his own personal hardships. Thank you David for sharing Jesus! Regina was born and raised in Bastrop. She has six sisters, three brothers and thirty-two nieces and nephews. She was raised by both parents and was brought up going to church. 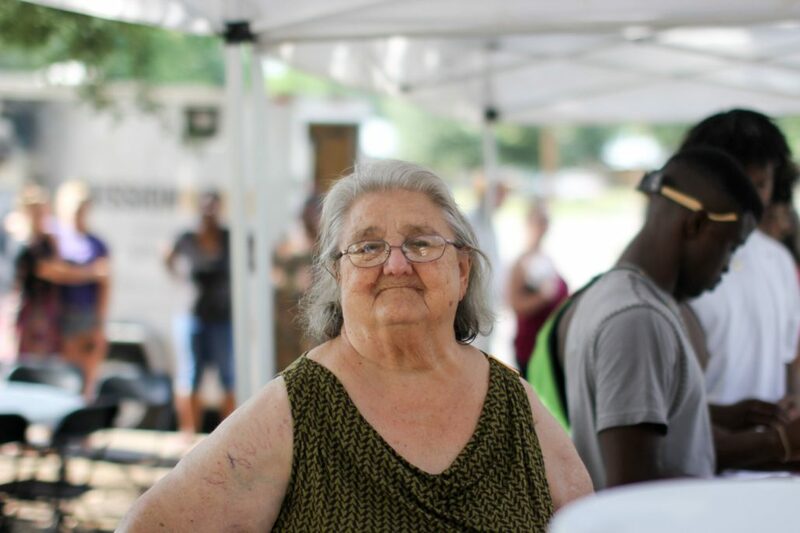 After coming for a year Regina now serves at our Bastrop Feed the Need site by cutting up vegetables. Her and Dwight both stay for the bible study. Regina enjoys the bible study time because sometimes she might have to miss Sunday church. On these occasions, she can come to the site to hear God’s word and to be loved on unconditionally. Every week until the end of the year we will be sharing stories from each of our six communities. Each of our communities serve anyone who stops by, but we have noticed that at each site similar stories start to pop up. We see God using our volunteers and those that come to grow and build relationships with those in Christ. Here are just a few of the stories from our location in Justin. 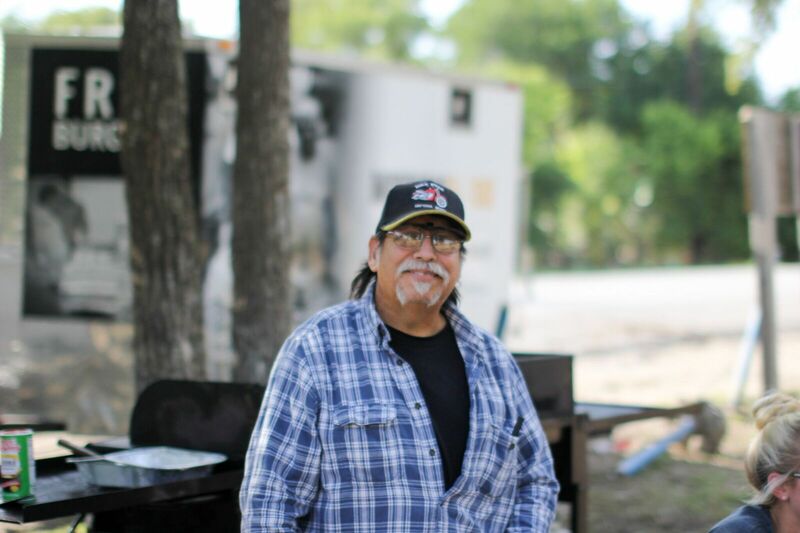 Justin serves on average 115+ meals every Thursday at Justin City Park. This site is one of our newest sites and currently our only site in the Denton area. Those we serve come broken and afraid of what others will think of them. Relationships are being made with the love of Christ, and we are able to be good witnesses, a listening ear and help them through their brokenness. Daniel and Brandy married a year ago in November. Their past has been full of addictions and abuse and they decided together they needed to move. Where to move was the question they faced. They knew they had to get out of the devastating situation they were currently in to be able to pursue Christ again. Through prayer the Lord told them to move to Texas. They obeyed and ended up in Justin, Texas just outside of Fort Worth. They found a house to build a stable home for their three children. Daniel was at the library one Thursday night studying for his seminary classes. Brandon, the Feed the Need Justin Site Coordinator, walked into the library, approached Daniel and offered him food. Brandon shared about Feed the Need Missions with Daniel as they walked across the field to our new site. Little did Brandon know Brandy, Daniel’s wife, was at home recovering from a hernia surgery. When Daniel brought dinner home for the family Brandy asked, “who did this for us?” Now their family attends our site faithfully and serves their community. Daniel has even shared his testimony at the site. “Feed the Need Missions has started filling that void. You know, the void you have when you’re trying to get your life back on track and not sure where to turn. We needed loving guidance and good friends in Justin,” Daniel said. This is the kind of difference you are making when you give to support our communities. 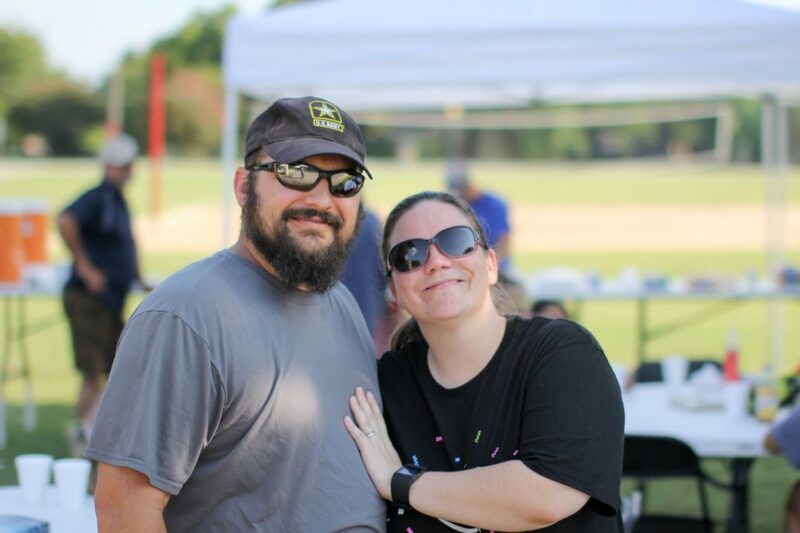 With your help, Feed the Need Missions will continue to provide a safe place people like Daniel and Brandy can gather for a hot meal each week, a place where you see the love of Christ in action. Can you help Feed the Need Missions continue serving each week by making a generous contribution of $25, $50, or $100 today? And if you give by the end of the year, thanks to a generous matching gift, your donation will be DOUBLED—up to $12,000—to make an even larger impact in the lives of so many people in our communities. So don’t delay, give today so you can DOUBLE your gift and help even more people like Mike experience unconditional love. Every week until the end of the year we will be sharing stories from each of our six communities. Each of our communities serve anyone who stops by, but we have noticed that at each site similar stories start to pop up. We see God using our volunteers and those that come to grow and build relationships with those in Christ. Here are just a few of the stories from our location in Stony Point. Stony Point serves on average 140+ meals every Monday at Stony Point Park. This area has been secluded by the county because of the high crime rate, but is now seeing the light in the darkness, literally and spiritually. The park now has lights, and is being mowed and cleaned up on a regular basis. Some areas are even getting new sewage put in. We have been able to bring people together and build relationships. Stony Point is a small area in Del Valle in the County of Bastrop. It’s an impoverished area with a lot of crime. AC has been a resident of Stony Point since 2005. 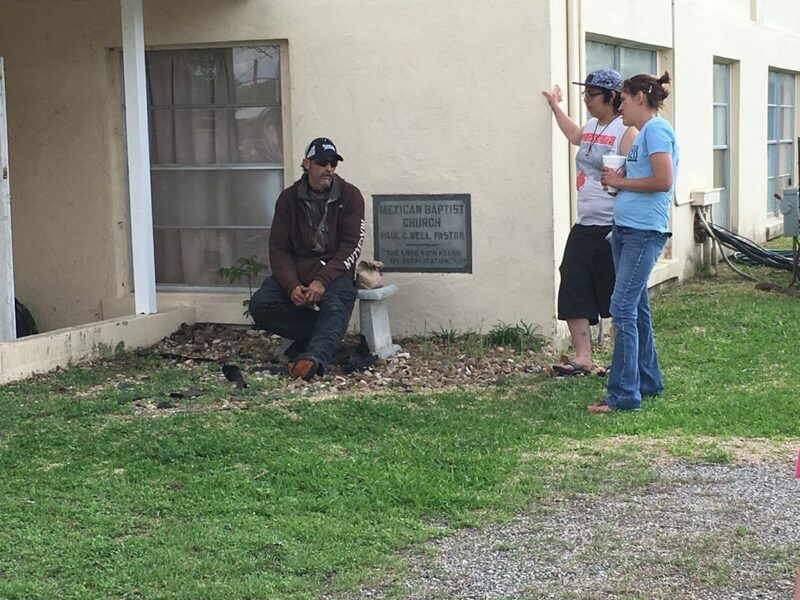 He stumbled upon Feed the Need Missions by driving past the site a few times on his way home. Not knowing too many familiar faces and seeing “Free Burgers” on the side of our trailer, eventually gave AC the courage to stop by. Gilbert and his wife have lived in Stony Point for many years. They both struggle with addiction and his wife recently graduated from Teen Challenge in San Antonio. She found friends at Feed the Need Missions she could confide in about her addiction to seek the help she needed to change her life. Gilbert is building trust and relationships with a few men from Feed the Need Missions. We were the light in the darkness and now Jesus is the light in his darkness, and through building relationships Gilbert’s walk with Christ is becoming deeper. His life is being changed. His addiction is being worked through and looks very successful. This is the kind of difference you are making when you give to support our communities. With your help, Feed the Need Missions will continue to provide a safe place people like AC and Gilbert can gather for a hot meal each week, a place where you see the love of Christ in action. Every week until the end of the year we will be sharing stories from each of our six communities. Each of our communities serve anyone who stops by, but we have noticed that at each site similar stories start to pop up. We see God using our volunteers and those that come to grow and build relationships with those in Christ. Here are just a few of the stories from our location in Giddings. 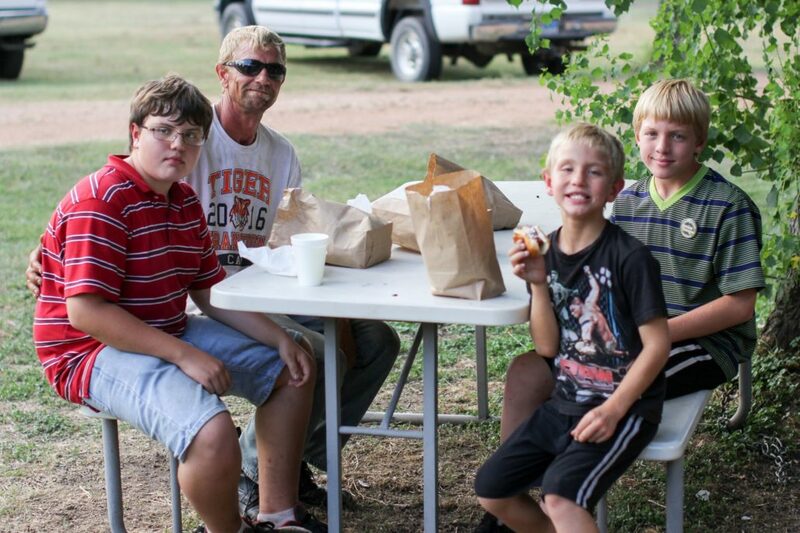 GIDDINGS serves on average 150+ meals every Sunday at the Giddings Food Pantry. There is so much brokenness within families and people in the community. We have been able to take the time to listen, build trust, and teach about forgiveness. This has allowed the community to be able to grow healthy relationships. 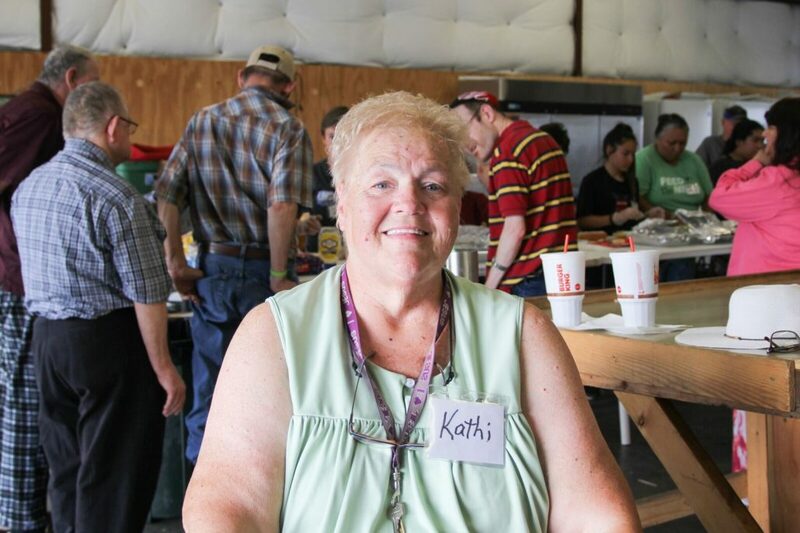 Kathi serves at our Giddings location. Being in a wheel chair and not able to serve at most places, she found herself overjoyed to be able to serve. Previously coming from a church that didn’t serve the community other than trying to get people signed up for their beliefs, Kathi realized that “it’s not about brownie points or doing good things.” She now attends a church that cares for and accepts people for who they are. It is through her new church where she heard about Feed the Need Missions. Kathi came wanting community and a place she could get involved. And she has now found a place where she can serve. “You guys even lower one of the tables for me so I can serve. You don’t have to do, but you choose to, that’s Christ love,” she said. The Garcia Family has been serving at our Giddings location for two years. They live on the outskirts of Giddings in a predominantly Hispanic neighborhood. Adrianna (mom) and Jose (dad) have four children: Pablo, Adrianna, Angela and Jose. They attend a local Catholic church in Giddings. Feed the Need Missions started out serving the family. Then after a few weeks the kids would serve while mom observed. A few months passed and Mrs. Garcia started serving with her children, and now Mr. Garcia comes to grill. Angela (9 years old) said, “I like to come for the people. 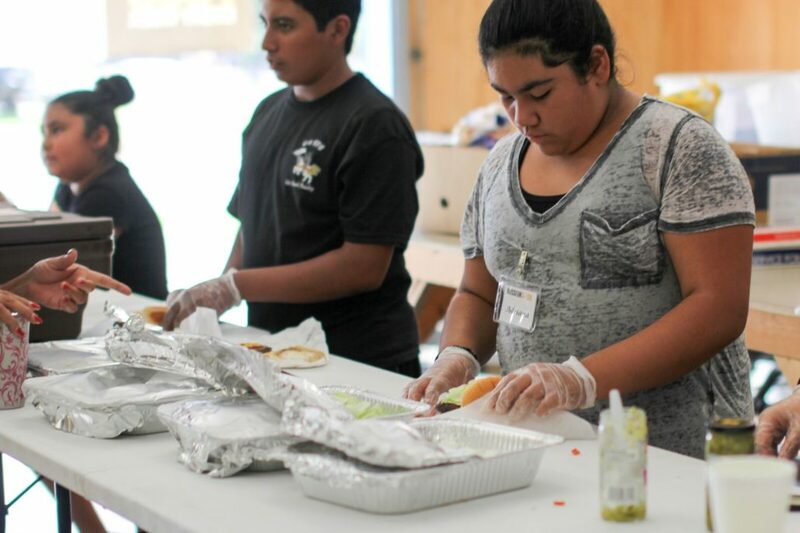 And the burger too, but I like to serve.” Mrs. Garcia takes the leftover food and gives it out to their community. She gives so much to those in her community while they struggle themselves. Mrs. Garcia has also opened her home to several of the volunteers for many occasions, even despite the language barrier. This is the kind of difference you are making when you give to support our communities. With your help, Feed the Need Missions will continue to provide a safe place people like Kathi and The Garcia Family can gather for a hot meal each week, a place where you see the love of Christ in action. Every week until the end of the year we will be sharing stories from each of our six communities. Each of our communities serve anyone who stops by, but we have noticed that at each site similar stories start to pop up. We see God using our volunteers and those that come to grow and build relationships with those in Christ. Here are just a few of the stories from our location Bastrop North. BASTROP NORTH serves on average 180+ meals every Sunday at the Bastrop Housing Authority. There used to be many fights and drug-related incidents in the area, and police officials were called on a regular basis. Since we have started serving here, we have seen the community come together and people are finding hope and seeing positive changes in the area. Eunice has been serving with Feed the Need Missions for four years. She started coming to Feed the Need Bastrop North when the site first started. She lives right down the street from our site and was interested in what was going on down her street every week. She came for a burger about two months after we started the site. 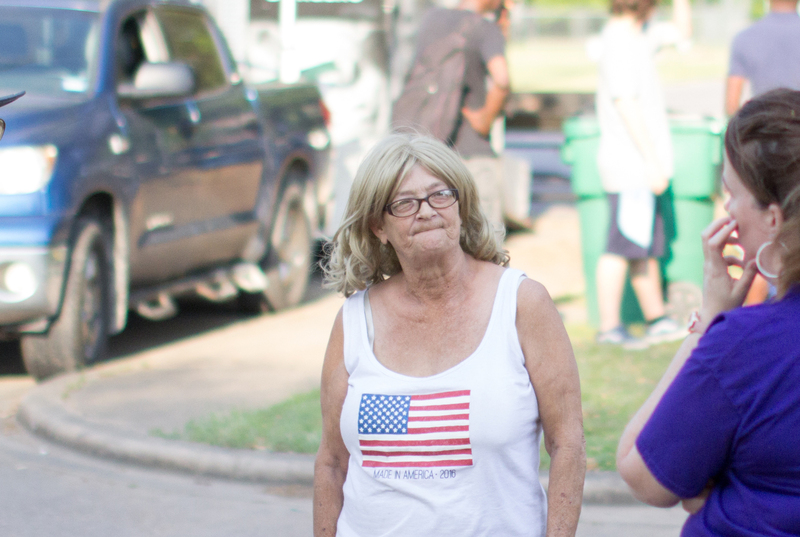 Eunice lives with her daughter in the Housing Authority of Bastrop. She has many medical difficulties and on a fixed income. Her and her daughter moved to Texas 17 years ago and her daughter was helping take care of her, until her daughter became sick. Now Eunice is her caregiver. “I have an opportunity to come into the community to do a positive thing. I can now serve those in need too. I sit at home a lot of times with nothing to do. Getting out has helped me mentally and physically,” she said with a smile and holding her heart. Gayla lost her husband a few months after she started attending. She was having a hard time adjusting to this huge change, and some of our volunteers noticed. 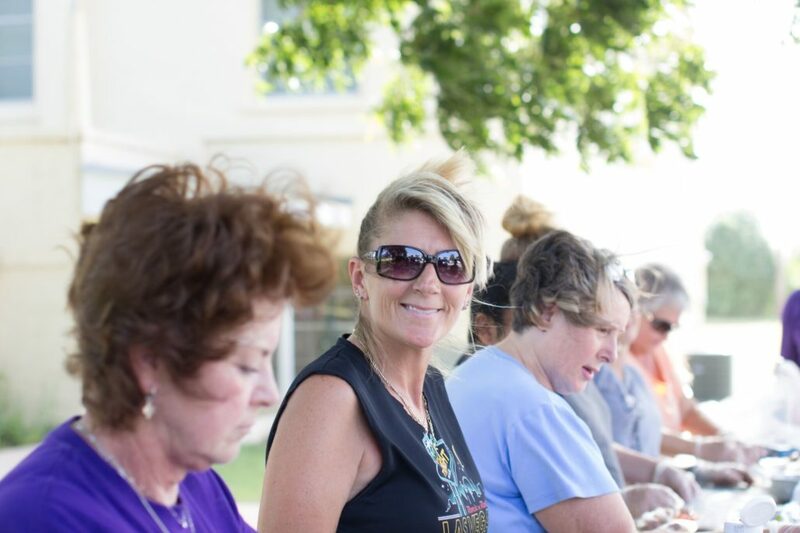 A few of the ladies from Feed the Need Missions reached out to her, and several came together to make the meal for the memorial service, while others helped pack her house for a fresh start. “You were all I had except for a few of my children. I had nowhere to turn and you have been there for me through everything,” she said. “Now I come so I don’t have to cook, but to also see everyone. I have hope again and my relationship with God is growing. It takes dedicated and true people to come out here every week and serve,” she included. This is the kind of difference you are making when you give to support our communities. With your help, Feed the Need Missions will continue to provide a safe place people like Eunice and Gayla can gather for a hot meal each week, a place where you see the love of Christ in action. Every week until the end of the year we will be sharing stories from each of our six communities. Each of our communities serve anyone who stops by, but we have noticed that at each site similar stories start to pop up. We see God using our volunteers and those that come to grow and build relationships with those in Christ. Here are just a few of the stories from our location in Smithville. SMITHVILLE serves on average 140+ meals every Sunday at The Neighbor Place at Hart’s Chapel. Because of the division of races, we have come together to unite the body and those we serve. Unity is bringing people together to be able to live safely and to share a meal with neighbors. Having to work full time and care for three children is exhausting. His oldest son is autistic, but Philip still finds the time to attend school events and to help his children with school work. Philip finds his strength in the Lord. The family would drive by our Smithville site every Thursday, and for a month or two Philip would watch out his van window to try and figure out was happening in his small community. He finally set his pride to the side and stopped one evening to get a hot meal. He asked why we were doing this and we told him to love on people, to give back to the community and to share the gospel. Philip knew he was safe and in the right place. To know the impact that Feed the Need Missions is making in his life is powerful. Philip and his boys are able to go to other sites when pennies are tight to receive what the need. They now stay for bible study and his kids participate by reading bible verses and praying for Feed the Need. Their lives are being changed, all because of a burger! 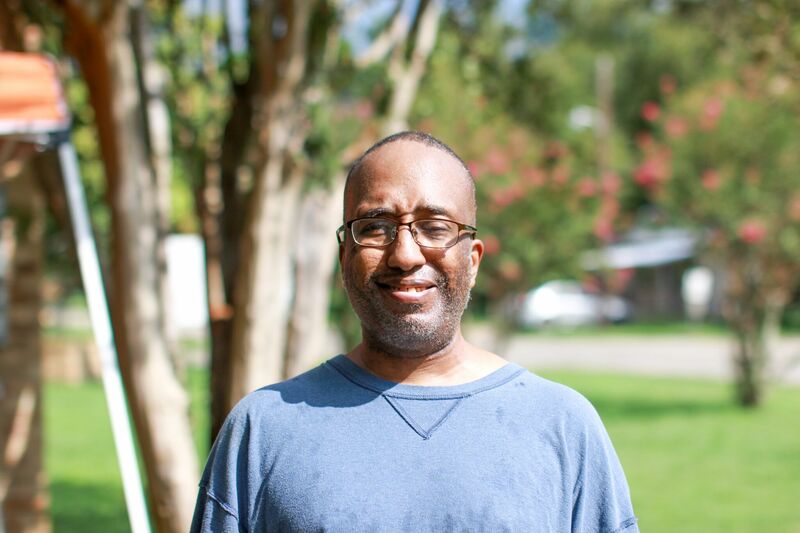 Building relationships is part of our mission, and Tyrone is experiencing the mission Christ told us to do. This is the kind of difference you are making when you give to support our communities. 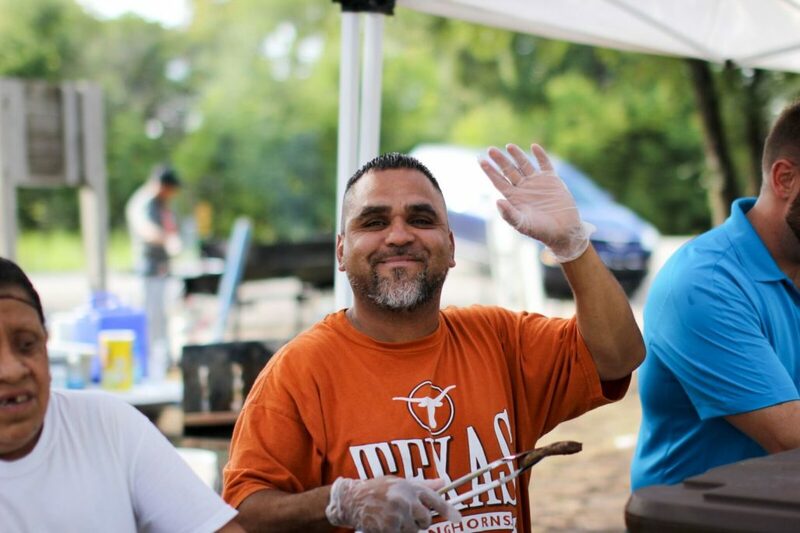 With your help, Feed the Need Missions will continue to provide a safe place people like Philip and Tyrone can gather for a hot meal each week, a place where you see the love of Christ in action. Every week until the end of the year we will be sharing stories from each of our six communities. Each of our communities serve anyone who stops by, but we have noticed that at each site similar stories start to pop up. We see God using our volunteers and those that come to grow and build relationships with those in Christ. Here are just a few of the stories from our oldest location, Bastrop South. BASTROP SOUTH serves on average 240+ meals every Monday at Primera Baptist Church. We also serve alongside of Hope House, which is an addiction program for women. This site serves a lot of homeless people and addicts. Sharing the love of Christ has helped many that attend get through tough times. Tina was searching for more. She struggled with alcohol addiction and was at a very low time in her life. She knew she wanted to be involved in ministry to some capacity, but wasn’t sure how to get there because of her alcoholism. While searching for this “more” she found herself drinking more and more and feeling sorry for herself, she knew she was being disobedient to Christ. Tina would serve on the line at Feed the Need and was very quiet and shy. She was angry about her situation and embarrassed to be there. She was worried about what others around her would think. Then she realized she wasn’t the only one that felt the way she was. She said, “it’s a great place to come and get out of yourself to be able to love on others. It’s also given me the opportunity to have my kids come down and serve and learn more about Jesus. He can see what others are going through.” Tina’s son is 9 years old. “I have volunteered for different ministries and food pantries throughout my life. I actually gave up on serving because of the way I was treated. I was a little skeptical about coming to Feed the Need Missions, but I came and you guys are so loving and treat everyone the way you would want to be treated. I come to be served and to serve,” said Brenda from our Bastrop South location. This is the kind of difference you are making when you give to support our communities. 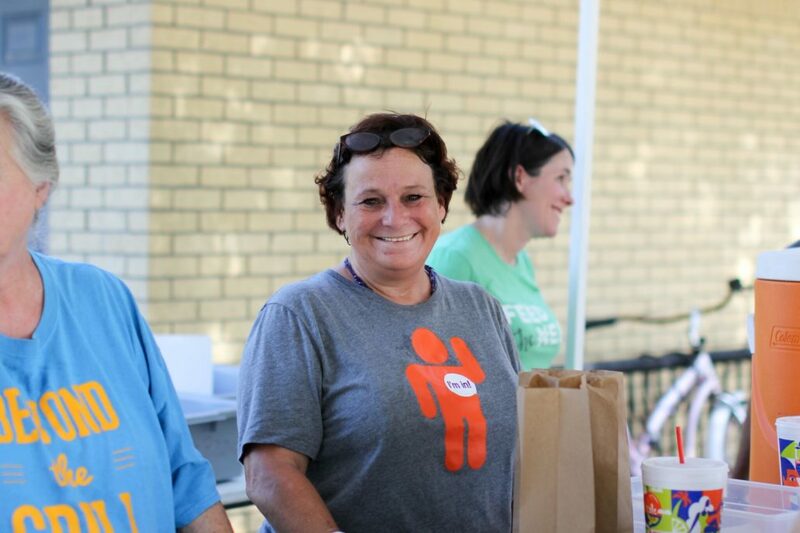 With your help, Feed the Need Missions will continue to provide a safe place people like Tina and Brenda can gather for a hot meal each week, a place where you see the love of Christ in action.